Raspberry Pi finally has an enterprise grade, 64 bit Linux based operating system. During SUSECon, 2016, SUSE announced that SUSE Linux Enterprise Server (SLES) SP2 will support the Raspberry Pi 3, Model B.
Powered by quad-core ARM Cortex-A53 processor, this device is the first 64-bit product by Raspberry Pi (Trading) Ltd. However to date there have been no 64 bit operating systems to take advantage of it. SLES is the first to do so. SUSE supports many architectures and the theam have been working with ARM for SLES. "We noticed that the processor on the Raspberry Pi 3 Model B was a Broadcom BCM2837 64-bit A53 ARM processor," Jay Kruemcke, Senior Product Manager – SUSE Linux Enterprise at SUSE, wrote on the SUSE blog , "So theoretically, much of the work needed to enable this processor in SUSE Linux Enterprise Server (SLES) had already been done as part of the SLES for ARM project." As there are over 10 million Raspberry Pi devices, it's a big enough market for SUSE to invest resources into supporting the device. Another incentive for SUSE, according to Kruemcke, was that the small size of the Raspberry Pi means SUSE's field team will be able to demonstrate SLES easily at trade shows. In order to get developers excited, SUSE is also offering a one year free subscription for SLES SP2, when users download . Bear in mind that only the Raspberry Pi 3, running the ARMv8 based processor, is supported by SLES SP2 and openSUSE Leap 42.2. Altair Semiconductor, a provider of single-mode LTE chipsets, is bringing LTE connectivity to the Raspberry Pi. 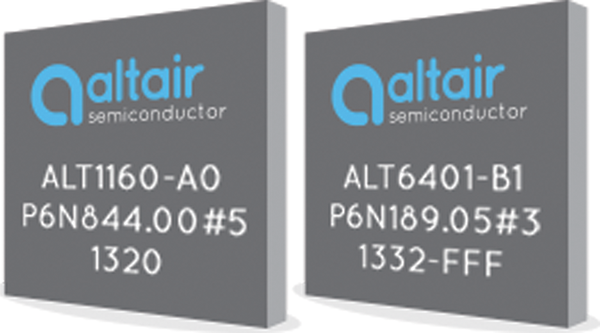 Altair Semiconductor has completed a trial of ALT1160 CAT-1 chipsetthat will bring cellular connectivity to the credit card-sized computer for the first time. The Raspberry Pi is a very versatile device, but currently only supports WiFi and Bluetooth which have a limited range. This also restricts many applications capable of cellular connectivity. "The solution will enable users to quickly browse the internet and stream high-definition video from anywhere, in addition to other applications such as (home automation, robots or remote surveillance camera with LTE access," Altair said in a press release. LTE access will also enable richer applications like full home automation even when the WiFi is down, robotics, surveillance and much more. "We are dedicated to providing low-cost, high-performance computers to connect people, enable them to learn, solve problems and have fun," said Dr. Eben Upton, CEO of Raspberry Pi (Trading) Ltd.
Altair's LTE Category-1 chipset is extremely power efficient and offers download speeds of up to 10Mbps. Altair said that the chipset is software upgradeable for CAT-M1 LTE connectivity, targeting low power, low throughput IoT devices. "The cost-optimized chipset is highly integrated and includes an advanced on-chip power management unit, integrated DDR memory and a low power CPU subsystem with a strong security framework for customer developed applications," according to an Altair press release. PCWorld reports  that the chipset will be offered through third party add-on modules for the Pi.